Auburn, WA, September 08, 2018 --(PR.com)-- Ekene A. “Kennie” Amaefule, RN, MN, CRRN of Auburn, Washington has been honored as a Woman of the Month for August 2018 by P.O.W.E.R. (Professional Organization of Women of Excellence Recognized) for her outstanding contributions and achievements in the field of healthcare. Each month women are featured to represent their professions and industries due to their expertise and success in their chosen specialty. Ekene Amaefule has been in the nursing arena for almost 25 years. She is the Founder of Caring Hearts International, which is a not for profit charitable organization dedicated to alleviating the healthcare and social services crisis in eastern Nigeria. Some of their projects include medical missions, sending school materials to assist with teaching and learning, awarding scholarships to indigent students, sponsoring orphanages and food banks, and providing HIV/AIDS awareness and health awareness education. Recently, she purchased land and has begun construction of a free medical clinic. This clinic will include a women's center where local women can learn to develop marketable skills. She has established micro loans for the youths in her native village in Nigeria to learn trades/skills and become entrepreneurs. During one of her visits to an orphanage she sponsors, she adopted twin Nigerian baby boys who had been abandoned. Her twin boys are flourishing and are fifteen years old now. Kennie oversees the operations and efforts of the Organization. She served as the Nurse Manager of the Rehabilitation Department at the Puget Sound Veteran Administration Medical Center. She is currently the Senior Clinical Reviewer of the hospital, ensuring that our Veterans receive optimal care. She also reviews every death of Veterans in the hospital. As a social activist, Ms. Amaefule is a tireless leader in nursing in the global community. To decrease water-borne diseases, she spearheaded funding for the drilling of a new well in eastern Nigeria. In celebration of the new well, Amafuele was crowned honorary chief Ugochinyere l, "An Eagle from Above," making her the first woman to receive such royalty in her state. The governor of Imo State has recognized her contributions nationally. Here in the States, Kennie continues to exemplify the highest standards of humanitarian service by volunteering in her neighborhood school, church and workplace with emphasis on the homeless, chemical dependent and others in need. She is an active mentor and tutor to minority students. In her spare time she enjoys spending time with her family. 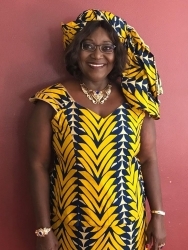 Kennie earned her Master’s Degree in Nursing from the University of Washington in 2002 and is a member of Multi-Cultural Alumni Partnership (MAP). In 2017, she was awarded the Distinguished Diversity Advocate Award from the University of Washington, School of Nursing. This award honors a nurse who advocates for the needs of underrepresented populations and communities, encourages dialogue and reflection regarding societal power imbalances; and demonstrates leadership in promoting diversity in nursing. After years of modeling and acting, Kennie got married, had children, gained weight and reconsidered her career. Her mother had always told her she would make a great nurse. She has always loved helping people, especially the helpless. She feels the biggest challenges today in nursing are the changes in the role. Nurses are being forced to manage many roles and sometimes serve as providers and decision makers. This takes away the holistic care that patients need. Her advice to women starting out in nursing is to love the profession first before any other career benefits. For further information, contact www.caringheartsinternational.org.